Republican Rep. Andy Harris of Maryland was headed to his office when two red-hatted protesters associated with DCMJ, the pro-marijuana group, attempted to follow him into his office. One of them was hit by the door, and stumbled back into the hallway. The protesters were part of a small group carrying signs alleging that Harris worked for "big Pharma." According to the DCMJ website, the demonstrators were there to protest Harris' opposition to using marijuana as a treatment for the opioid crisis. Shortly after the door to Harris' office slammed, the two lay on the floor in protest. 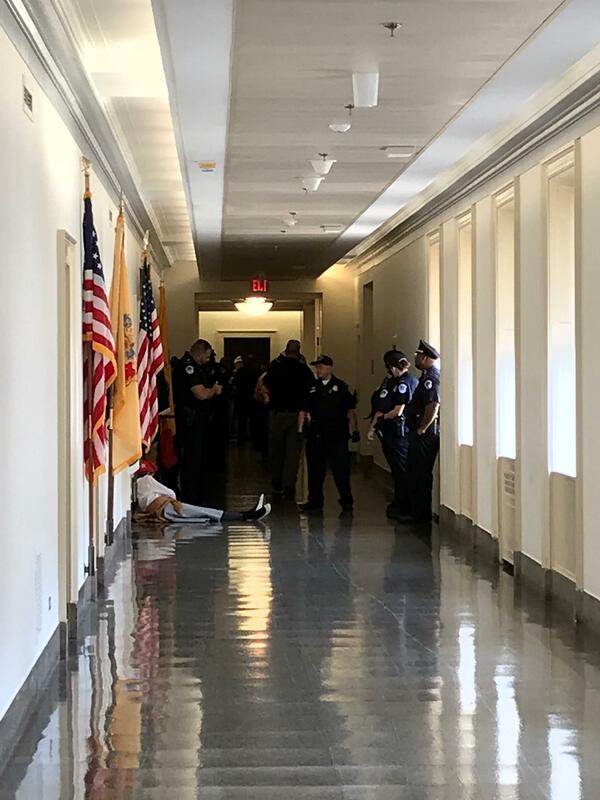 When Capitol police arrived, another protester told an officer that Harris had slammed the door on the foot of one of the protesters who was lying down. One of the protesters was handcuffed by the police, while the other remained on the floor. The smell of cannabis wafted through the air, as someone had lit a joint. The protester whose foot had allegedly been crushed by the door remained on the ground as officers crowded around her. "Can you stand at all, ma'am?" one of the officers asked the woman, who had initially been standing after the door-foot collision had taken place, just moments before. A medic looked over the protester. Eventually, she was wheeled away from outside Harris' office, sporting a wheelchair and handcuffs. According to a spokesperson for Harris, the congressman was in his office when the protest began, and promptly left after it started. Harris released a statement later in the afternoon condemning the protesters' actions. "Today's aggression by protesters who disagree with my position on the legalization of recreational marijuana demonstrates the problem with political discourse today. We all must agree to have a civilized debate when disagreement occurs. My parents fled communist Eastern Europe where people with different political opinions were harassed and punished, and it has no place in America," Harris said.